By Christa T. for Accordion Americana According to Slambovian philosophy, within every woman lives a Tinker Bell or a Wendy. If acceptable as words to live by, or as a stunning oversimplification, such a statement shouldn’t be analyzed too deeply. Rock music is notoriously shallow, but can be such fun. Not often has a band captured the imagination of so rabid a following as does Gandalf Murphy and the Grand Slambovian Circus of Dreams. Whether a band of pirates and thieves, beggars or misfits, Slambovian fans recognize something of themselves in them, some travelling hundreds of miles to attend concerts. Based in New York State’s Hudson Valley, and conceived in 1998 in Sleepy Hollow, N.Y., members of the band consist of Joziah Longo, lead vocal and guitar, Sharkey McEwen, lead guitar and vocal, Eric Puente, drums and Tink Lloyd, Accordionist and Multi-instrumentalist. In addition to the accordion, one of Tink’s notable instruments includes one rarely heard or seen, the Theramin. In the late 1980s and early 1990s Joziah, Tink and Sharkey were members of the progressive Rock band, The Ancestors, which released 3 albums. The three of them took a break from the road, focused on other things and then took a new look at music, reforming with a radically different and brilliant concept, one of a wandering band of Gypsies. The latest recording for Gandalf Murphy and the Grand Slambovians Circus of Dreams is “A Box of Everything”, released in April of 2014. The band regularly plays major Folk music venues, coffeehouses and music festivals often to sold out crowds. In August 2008 they made their first appearance outside of North America at the Rhythm Festival in the United Kingdom. Their reception in England was so enthusiastic that they were invited back for the 2009 festival, as well as several other UK festivals. The flavor of the band is best captured by a live concert, or by one of their live recordings. The band is noted for the dedication and support shown by their fans. A high point of each year for many fans are the Grand Slambovian Hillbilly Pirate Balls, annual costumed events held in London and New York preceeding Hollowe’en. In the Spring of 2015, the band will be on tour with stops in New England, Eastern Canada, and the Midwest. Their music is fresh, original and current, yet harkens back to the golden era of the late 1960’s. It’s obvious that to the loyal fans of The Grand Slambovians, the accordion is a much loved element of the band. 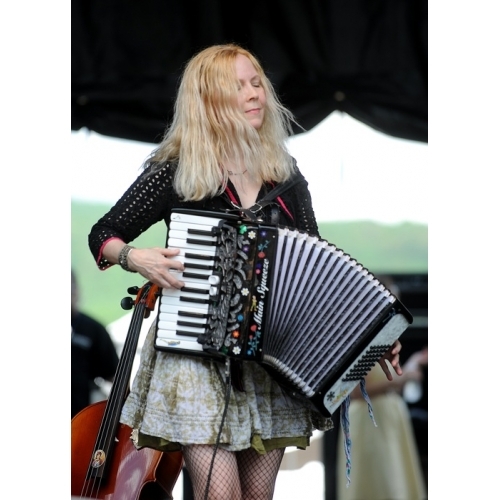 Tink Lloyd and her accordion bring a unique quality and presence to the band’s music. Tink is a gifted and skillful musician and, unlike the Tinker Bell character, not a Peter Pan groupie.